Back on line. Back on duty. When the ruthless corporation that runs Motor City begins kicking families out of their homes to clear space for a profitable new real estate project, Robocop (Robert John Burke) joins forces with a renegade band of freedom fighters to save them. But Robocop must face some deadly foes, including a lethally efficient android and a dangerous gang of thugs. Robocop's latest arsenal of high-tech weaponry only somewhat evens the battlefield, as this lone superhero takes on the entire army of a corporate militia in an all-out war to control Detroit! $4.300 million on (unknown) screens. While 1987’s Robocop offered something new and innovative and also turned into a surprise hit, 1990’s Robocop 2 fell short of its predecessor. Its box office gross wasn’t too far below that of the original, but it didn’t inspire many positive reactions from fans or critics, and it’s come to be seen as a bomb. Since Robocop 2 generally flopped, I didn’t expect to see another entry in the series. I was wrong, as 1993 brought Robocop 3. However, it didn’t resuscitate the series, as it did much worse than 2 with a gross of only $10 million. With its “PG-13” rating, it also lost the grittiness of the first two and tried to make the bloody world of Robocop more family friendly. As with the first two flicks, 3 starts with another Media Break. Through it we learn that Omni Consumer Products (OCP) - the group that runs trhe Detroit police force - still pushes for a new development called Delta City. This requires the eviction of current residents, so OCP sends a brutish military force called “Rehabs” to drive out those folks. Rebels fight against this, and we initially see Bertha (CCH Pounder) strike back with bombs to stop OCP’s takeover. She rescues young Nikko (Remy Ryan) when the child gets separated from her parents. The techno-savvy Nikko helps the rebels subdue ED-209 when they invade the police armory, and the cops chase them after they steal weapons. Robocop (Robert Burke) needs to chase the rebels, but he abandons that hunt when Splatter Punks terrorize his partner Lewis (Nancy Allen) and other cops. In addition to the rebels, other problems plague OCP. A Japanese corporation buys the company, and OCP CEO (Rip Torn) gets pressure from their chief Kanemitsu (Mako) because Delta City falls behind schedule. The CEO wants Robo to battle the resistance, and he gives Rehab team leader McDaggett (John Castle) four days to clear out Cadillac City, the future location of development. In addition, Kanemitsu sends warrior Otomo (Bruce Locke) to deal with the problem. OCP Dr. Marie Lazarus (Jill Hennessy) nurses Robo back to help. She resists when OCP exec Fleck (Bradley Whitford) orders her to remove his emotional functioning after Robo disobeys an order to help Lewis. She says she’ll insert a bypass chip but doesn’t do it. Robo and Lewis go to the church hideout of the rebels, and the Rehabs converge on it right after that to remove the squatters. Robo stands up to the Rehabs to protect them, but Lewis gets shot in the melee and dies. She implores him to solve the problem, and Nikko recruits Robo for the rebels. The rest of the film follows the battles between the two sides. A more talented director might pull off this nonsense, but Fred Dekker? No offense to him, but he fits the definition of a no-name. The first flick boasted Paul Verhoeven, who achieved success with subsequent flicks such as Basic Instinct and Total Recall, while 2 utilized Irvin Kershner, the director of The Empire Strikes Back. What else does Dekker have to his credit? Not much, and he’s not directed anything since 1993. Granted, I don’t think David Lean could have done anything with the silly mush that is Robocop 3. I knew I was in for trouble when I saw an in-movie display that misspelled “Anne” for Lewis as “Ann”. That’s sloppy and sets the stage for a far below average movie. In this flick, we see Robo become the surrogate father to an orphaned cutie. I should stop my review there, as I don’t think there’s much else you need to know about the way this movie will go. Or maybe you do need to know more. In 3, we also see a) Robo drive a pimpmoble; b) ninja robots, and c) a flying Robocop. Yikes! Really, 3 goes for more of a wacky comedic vibe than the prior flicks, and it loses the original’s deliciously dark and cynical wit. It shoots for goofier and more obvious laughs and lacks the first movie’s bite. None of the gags connect. Do any of the action sequences redeem this? Not in the least. The movie uses chases and explosions in attempts to bring out life, but they fail. Frankly, none of them will stay with you, as they all seem totally forgettable. Unfortunately, you won’t be able to put out of your mind all the cheesy elements. Whereas the original presented some real human drama and emotion, 3 just goes for cheap sentiment. Lewis dies for no reason other than an attempt to create some feeling. It doesn’t happen, and her demise works as nothing other than a seedy gimmick. Allen’s presence comes across as more of a contractual obligation than a real role; I get the impression she agreed to appear in this dud only if they made it difficult for her to be stuck in a Robocop 4. Of course, her death then gives the movie an excuse to go on a revenge theme similar to that of the first film. Unfortunately, since the whole thing feels tacked on, we don’t care. We should be moved and upset by the death of Lewis, but that doesn’t happen, and the movie just plods on its irrelevant storyline. With each film, we lose more and more members of the original cast and crew. As noted, Allen makes a gratuitous appearance, and Peter Weller finally finds a way out of the continuing nightmare. Robert Burke makes for an able doppelganger – he looks a lot like Weller - but he doesn’t bring the same gravity to the role. He seems to be in the role just for the physical resemblance, as he isn’t much of an actor. Not that it would matter, since Robocop 3 isn’t much of a movie. Is it a big drop-off from Robocop 2? No, for that flick stunk as well. Neither of them merits consideration as part of the same series as the original. 3 is silly, moronic and boring. Robocop 3 appears in an aspect ratio of approximately 1.85:1 on this Blu-ray Disc. 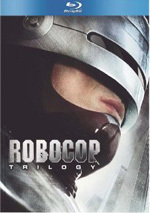 When I reviewed the Robocop DVDs, I thought 3 looked the best of the bunch. That didn’t hold true on Blu-ray; while more appealing than the first film, 3 fell short of the strong visuals found with 2. Sharpness was usually fine, but exceptions occurred. While I never saw serious softness, I thought the movie could be a bit on the mushy side at times. Overall definition was fine, though; only sporadic instances of moderately imprecise visuals appeared. I saw no concerns with jagged edges or moiré effects, and edge haloes remained absent.. Print flaws weren’t extreme, but they caused more distractions here than during the first two flicks. I noticed sporadic examples of specks and marks; again, these weren’t intense, but they came up more often than I’d like. While the world of Robocop didn’t present a terribly varied palette, the movie’s colors looked fine. The hues were nicely clean and distinctive, and they consistently remained accurate and tight. Black levels also were deep and firm, while low-light shots appeared clear and well rendered. This was an acceptable transfer, but the occasional instances of softness and source defects dropped my grade down to “B-“. The DTS-HD MA 5.1 also worked pretty well, but it displayed some inconsistencies. The soundfield demonstrated a fairly heavy orientation toward the front channels. They presented nice stereo imaging for the music as well as the effects, which showed good delineation and movement. The surrounds added a generally positive level of interaction, particularly during the movie’s many action scenes. Those demonstrated a lot of material from the surrounds, though the forward domain still dominated. Where the mix lost some points came from the balance and the quality. At times it seemed tough to hear dialogue because it became buried under the effects. For example, during the relocation scene, Bertha spoke but I could barely hear her. That issue popped up a few times and it often was a little too tough to comprehend speech. Quality also varied. Speech remained intelligible - when I could hear it - but the lines occasionally sounded somewhat feeble and lifeless. Music mostly was reasonably clear, but some distortion affected the score at times. Effects usually sounded clean and accurate, but the track lacked great punch. Much of the time the audio came across as a bit bland and flat, and it didn’t present much oomph for the most part. The soundtrack seemed decent but not much better than that. Want some nice extras? Sorry – you won’t get them. The disc provides a trailer for Robocop 3 and that’s it. Hopefully Robocop 3 marks the last flick in the series, as both sequels failed to even remotely approach the highs of the original. 3 shows a decline from the crummy 2, which I didn’t think was possible. The Blu-ray presents decent but erratic picture and audio and no real supplements. This is a mediocre release for an awful film.